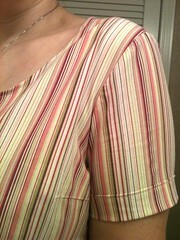 I began by taking in a couple inches on either side and about an inch in each sleeve. 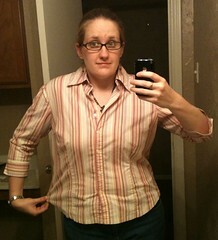 Then I chopped off about half the length from the sleeves, folded up new cuffs, and stitched them down. 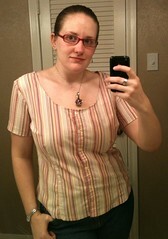 Finally, I cut off the collar and surrounding fabric, and hemmed up my new neckline. That's it! Just a couple changes, and I've got a top that might actually see the light of day again. That's much nice! Do you wear it more often? Thank you! Yes, I do wear it often, or at least as often as anything else. I guess nothing really gets worn a lot when you have as many clothes as I do.